Artist's depiction of an elaborate tomb dating to before 1000 years ago (A.D. 1000) based on one documented by archeologists beneath Mound C at the George C. Davis site in 1969. Eight individuals were laid to rest in this tomb and were accompanied by various grave offerings including a ceremonial flint "sword" blade that symbolized authority. One interpretation is that the individual buried with the blade was an important leader. The other seven people may have been retainers, slaves, or family members sacrificed to honor the departed leader. Similar tombs are known from many ancient Caddo sites, especially those dating to the early Caddo era (about A.D. 800-1200). Courtesy artist Nola Davis and the Texas Parks and Wildlife Department. 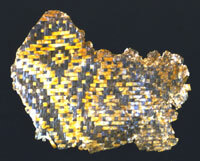 Woven mat fragment with bird design found in a large Early Caddo tomb at the Mound Plantation site along the Red River in northwest Louisiana. The mat fragment was preserved only because the tomb was waterlogged. According to early chroniclers, the Caddo were famous for their woven mats. Deceased individuals were often laid to rest on such mats. Courtesy Pictures of Record. Small part of the collection of a notorious grave robber who dug up hundreds of Caddo graves in northeast Texas. Following his death, the looted grave offerings were sold to private collectors. Photo from TARL archives. Caddo ancestors were laid to rest within the Caddo Homeland for generation upon generation. Following the accepted burial custom of the day, grieving relatives laid each departed Caddo in his or her grave with solemn rituals that, in historic times, traditionally lasted six days. 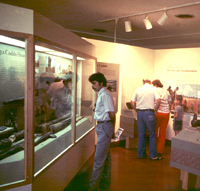 The interpretive displays at Caddoan Mounds State Historic Site (George C. Davis archeological site) allow the public to see artifacts from graves in context with information about many aspects of ancient Caddo society. Courtesy Texas Parks and Wildlife Department. This replica "tail-rider" bowl was made by Caddo tribal member Jerri Redcorn based on the original found in a grave at the Battle site in 1912. Redcorn has almost single-handedly revived the Caddo ceramic tradition and uses ancient Caddo pottery as sources of knowledge. Bowl courtesy Tim Perttula. Photograph by Sharon Mitchell. 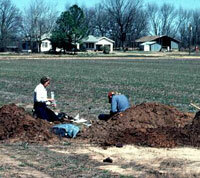 Archeologists document a recently looted grave in early 1980s at the Hatchel site (part of Upper Nasoni village) on the Red River near Texarkana. The uncontrolled digging apparently had been done with the permission of the landowner. (The present landowner of this site does not allow grave robbing.) Photo courtesy Texas Historical Commission. Caddo ancestors were laid to rest within the Caddo Homeland for generation upon generation. Following the accepted burial custom of the day, grieving relatives laid each departed Caddo in his or her grave with solemn rituals that, in historic times, traditionally lasted six days. Often the custom included burying the dead with special artifacts or offerings, especially beautifully decorated pottery vessels, but also with shell ornaments and other items symbolizing their role in society and other things as well. Since Late Woodland times, over 1200 years ago, Caddo people were buried soon after death in manner that archeologists describe as primary interments. Typically, the deceased were laid out on their backs in a fully extended position, a single individual in each grave. In contrast, in many areas of the Eastern United States (including the Arkansas Basin) the deceased were placed in charnal houses where priests defleshed the bones and stored them for months or even years. In such societies, the stored remains were periodically gathered and buried in ossuaries, large communal graves, as secondary interments, as part of communal rituals. Craig Mound at Spiro is an extraordinary example of a complex mortuary facility. In prehistoric and early historic times, the offerings and burial rituals for important Caddo leaders were very elaborate, representing major expenditures of effort and wealth apparently thought to befit the leader's exalted position in society. Sometimes leaders were buried in deep tombs dug through mounds and into the original earth, perhaps symbolically connecting sacred times past with the departed. At other times leaders were buried among their people, but even then their graves were set apart by size, location, and offerings. Ordinary Caddos had less elaborate graves and were often buried in family cemeteries and sometimes (especially children) buried beneath the floors of their houses. These differences are just a few of those that could be mentioned; Caddo burial practices were somewhat different from group to group and they changed over time. We know this because grave robbers, farmers, archeologists, and construction bulldozers have been digging up Caddo graves for over a century, a fact that causes great pain to many Caddo people today. And if it were the graves of your ancestors, you might understand how the Caddo feel: violated, disrespected, and very sad. There is no easy way to explain what has happened or why and no way to reconcile all the conflicting views on the subject of Caddo graves. Since the early 1900s archeologists have sought out and excavated Caddo graves, most of which faced imminent destruction by looters, farming, and natural erosion. The graves, skeletal remains, and associated offerings have provided critical knowledge about the Caddo past. For example, information on social organization, health, and disease based on Caddo graves is not otherwise obtainable from archeological evidence. The way a society treats its dead says much about that society, and clearly there is no other comparable source of information for prehistoric societies. In addition, physical remains are practically the only source of information on individual lives of prehistoric people, as well as on the biological relationships among individuals and populations. Unfortunately, for many decades archeologists treated Caddo graves with little awareness of the feelings of living Caddo peoples. Taking a Western scientific perspective, archeologists regarded human remains and grave offerings as mere evidence, perhaps important evidence, but evidence nonetheless. In this view, the remains are considered dispassionately and treated like any other fragile and potentially important kind of artifact. With that attitude, most archeologists had no interaction with the Caddo tribe because they really didn't see much connection between the ancient Caddo and the living Caddo. Part of the problem was that, by the 20th century, very few Caddo people lived in the Caddo Homeland where archeologists were working. Unfortunately, the thought that Caddo people living in west-central Oklahoma might still care about the graves of their distant ancestors was just not there. To be fair, to most archeologists the concept of "ancestors," as seen through western eyes, refers mainly to relatives a family still retains memory or record of. They did not appreciate the fact that in Native American eyes, ancestors of the recent past are thought of in much the same way as ancestors of the ancient past. This attitude was not unique to the archeologists who worked in the Caddo areait was widely shared by most American archeologists. American archeologists came to believe that many aspects of prehistoric North American were essentially unconnected to modern tribestoo much time and too many changes had occurred; cultural continuity had been lost. Archeologists saw themselves as the only ones truly interested in the prehistory of North America and thought that archeology was the only thing standing between ignorance of the past and willful grave destruction. As enlightened scientists, archeologists sincerely believed they were working against the inevitable march of progress and against the "dark side"grave robbers and land development. In truth, most people who dig up Caddo graves are not archeologists; they are artifact collectors intent on finding valuable things, most of all, whole pots. They are usually called pothunters, looters, or grave robbers. Some do have an interest in documenting what they find and consider themselves "amateur archeologists," but most dig up graves solely to find grave offerings. Most dig without regard to whatever human remains they find and keep little or no record. As a group, grave robbers are highly secretive and rarely publish descriptions of their work and findings. Some want the artifacts just for their own personal collections, but increasingly the motive is greed. 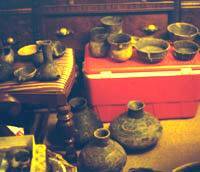 An intact, finely engraved Caddo pot can bring thousands of dollars on the antiquities market. Untold hundreds of Caddo graves are dug up every year in this manner, at least an order of magnitude more than the number of graves that archeologists excavate. Today, archeologists rarely excavate Caddo graves except in circumstances required by federal and state cultural resource laws and/or occasioned by emergency salvage. When archeologists encounter Caddo graves during the course of cultural resource management projects, they routinely consult with the Caddo Nation of Oklahoma. In contrast, grave robbing continues apace and slows only because so many cemeteries have already been destroyed. Still, hundreds of Caddo graves are dug up each year by those hunting Caddo pots. Grave robbers often tresspass on private, state, or federal lands and dig up graves surreptitiously and illegally. Arkansas, Oklahoma, and Louisiana all have laws affording some legal protection to "unmarked graves." Attempts to pass a similar law for Texas have failed repeatedly over the last two decades. Today, most professional archeologists in Texas hold the view that human graves, marked or unmarked, Indian or Anglo, historic or prehistoric, Christian or non-Christian, should be protected by law and left unmolested except when unavoidable or with particularly good cause, such as a significant research question that can only be answered by studying graves. In such cases archeologists should work with descendant communities to reach an equitable compromise between scientific and humanistic concerns. Such a compromise is not always possible. While all Caddo people may not have the same attitude toward the graves of their ancestors, most believe the resting places of their ancestors should be left undisturbed out of respect for their memory. One of the most remarkable things about ancient Caddo cemeteries is that one grave rarely intrudes into another, even in cases where the burials were separated in time by decades or even centuries. Given the complete absence of headstones or other durable markers, the graves must have been marked by perishable materials that were periodically renewed. This shows that Caddo cemeteries, like most cemeteries in the United States today, were created as permanent resting places that were cared for by succeeding generations. Given this tradition, it is easy to understand why some Caddo see grave robbing as grave robbing whether it be done in the name of science, curiosity, or commerce. Other Caddo see a difference and acknowledge that archeologists have learned many things about Caddo ancestors that had been lost. Much of the content of the Tejas exhibit you are reading comes from archeological research. For their part, most archeologists today realize that science is only one perspective and that Caddo peoples have every right to play a major role in deciding what should happen to Caddo skeletal remains, graves, and grave offerings. Most of the change in attitude came about after the passage of the Native American Graves Protection and Repatriation Act (NAGPRA). This federal law enacted in 1990 is really a civil rights law that has had profound consequences for the Caddo and most other federally recognized Indian tribes. Essentially NAGPRA says that human graves on federal and tribal lands are to be protected. It also says that Native American descendants should decide the fate of the skeletal remains, grave offerings, and sacred objects of their ancestors that are encountered by the federal government and held by any institution, such as a museum, that receives federal funding. NAGPRA requires federal agencies that administer or carry out archeological research on federal or tribal lands to consult with the appropriate tribes in advance of work that might disturb graves associated with their ancestors. The result has been that, for the first time, the Caddo tribe has been given a say-so in what happens when Caddo graves are encountered that fall under NAGPRA regulations. The Caddo tribe also has the right to decide what happens to the Caddo skeletal remains and grave offerings in museums and repositories across the country. As a consequence, constructive dialogues have begun between the tribe and all of the major agencies and organizations that are involved in archeology in the Caddo Homeland. NAGPRA attempts to balance the legitimate interests of Native Americans and scientists. While the intent of the law is clear and reasonable, the enabling regulations have created a tedious and contentious process that sometimes pits Native Americans against archeologists, oral tradition against science, and one tribe against another. For instance, who should decide the fate of the many skeletal remains and grave offerings that cannot be linked definitively to a living tribe? What happens when two tribes both claim the same grave? How about when a scientist wants to use destructive analytical methods in order to determine which, if any, living tribe can be linked to those skeletal remains? Fortunately, things have gone relatively smoothly in the Caddo Homeland in comparison to many other places in the country. For one thing the Caddo Homeland is well known and there are few disputes about whether a grave is associated with the tribe or not. Still, there are many issues that remain to be resolved. For instance, the Caddo Nation has not made a final decision regarding what to do with all the Caddo skeletal remains and grave offerings in museums and repositories. Some say "rebury them all," but how and where? Who will pay for proper burials for so many things? Others recognize that the thousands of Caddo pots sitting on shelves represent a tremendous cultural legacy. In many cases the skeletal remains the pots once accompanied have not survived (mainly due to acidic soil conditions). Should all these objects be buried again and, in essence, removed from visible Caddo history? 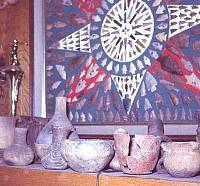 Some say that Caddo pots and other grave offerings should be returned to the tribe and sensitively displayed in a museum run by the Caddo. But building and running a museum takes lots of money and training. The tribe is taking positive steps in this direction with the creation of the Caddo Heritage Museum and its own Tribal Historic Presevation Office. 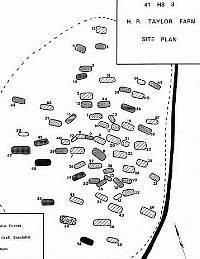 Plan of a Late Caddo community cemetery (about A.D. 1600-1700) at the Taylor Farms site near Lake O' the Pines within the valley of Big Cypress Creek in northeast Texas. The University of Texas excavated this site in 1931 and documented 64 graves. Note the fairly consistent east-west grave orientation and the fact that the graves do not intrude into one another. In truth, most people who dig up Caddo graves are not archeologists; they are artifact collectors intent on finding valuable things, most of all, whole pots. They are usually called pothunters, looters, or grave robbers. Caddo grave offerings displayed as trophies in the home of a notorious grave robber. Photo in TARL archives. This unusual "tail-rider" bowl was found in a grave at the Battle site near the Red River in southwest Arkansas in 1912 by C. B. Moore. Such vessels resemble those found in the Mississippi valley in northeast Arkansas and represent connections between the two areas in Late Caddo times. 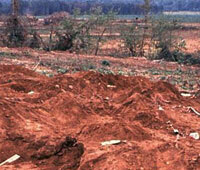 This Late Caddo cemetery in northeast Texas was destroyed by looters in search of whole pottery vessels. Broken pots and human skeletal remains were left behind in the churned up mess. While all Caddo people may not have the same attitude toward the graves of their ancestors, most that we know do. They believe the resting places of their ancestors should be left undisturbed out of respect for their memory. 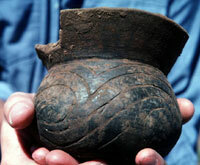 Small, Late Caddo jar excavated from a grave by the couple shown in picture on the left at the Hatchel site on Red River near Texarkana. Photo courtesy Texas Historical Commission.